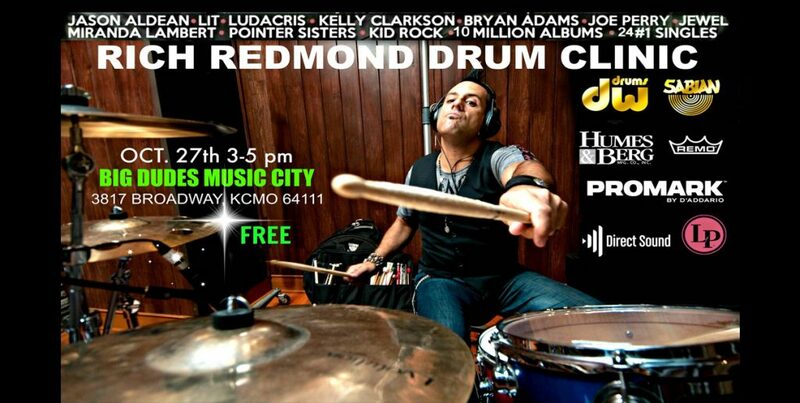 Rich Redmond Drum Clinic Oct. 27th 2018 3-5pm FREE! Award winning drummer/educator Rich Redmond from Jason Aldean is now offering his uniquely informative, motivational and entertaining teaching style to a group setting. Rich’s Clinic focuses on 20 years of real world experience combined with the classical training he received while pursuing a Master’s degree in Music Education. Rich has a true teacher’s heart as well as the ability to teach students of all ages and levels of ability. Rich’s Clinic offers insight into: The Basics of Hand Development, Reading Music, Drum Set Coordination, Drum Set Styles, Soloing, Song Charting, Style Analysis, Transcriptions, Use of Electronics, Incorporating Percussion into the Drum Set, Playing with Clicks and Loops, The “CRASH Course For Success Philosophy and more. Gathered from years of experience in the studio and on the stage, Rich shares his own lessons learned for personal and professional development. Drummers of all ages and levels of ability will benefit from the proven insights of one of the industry’s most in-demand drummer and percussionist.